If it's complicated, let Tablet uncomplicate it! Tablet is an illustration and design company dedicated to visualizing the things that are difficult to explain. We specialize in the creation of information graphics, diagrams, maps, data visualizations, instructions, animations, icons and symbols—basically we enable our clients to show instead of tell. If you have a project that could use some uncomplicating, then please call or email. Eleykaa was born in 1967 in Japan and raised in San Francisco, Hawaii, and Japan. Having first studied sumi-e (Japanese brush painting) from age seven, her tools of expression grew to include watercolors, pens, acrylics, pastels, and oils. Her present body of watercolor is representative of an original technique she calls Illumination Art, which much resembles the vibrancy of stained glass. 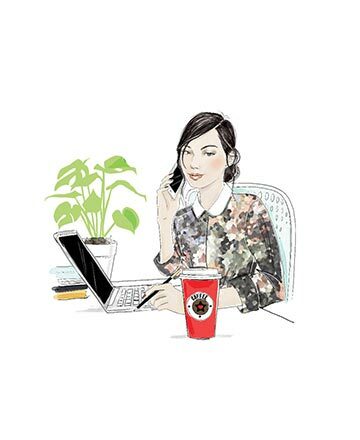 She also creates illustrations of characters and fun scenes geared for the commercial art market. Currently residing in Hawaii, she paints / illustrates full-time on the island of Maui. Funky, whimsical and cute illustrations. Sweet, graphic, pen and ink. Not just for kids! Illustration, Logo Creation, Web Design, Flash Design, and Animation. Dave’s strength is a combination of creativity and technical ability, providing expertise in a range of styles. This flexibility has provided his clients with a unique resource for their ongoing illustration needs. Dave’s work originates in both traditional media and on the computer, with all eventually becoming digital, enabling quick review of projects via e-mail. Clear communication, meeting deadlines and responsiveness to art direction has earned Dave a loyal client base and ensure each projects success. Gerad Taylor, born in Auckland New Zealand in 1960 has worked for over twenty five years as a freelance illustrator catering to the design, publishing and advertising industries. Gerad graduated with a degree in design and illustration from Massey University School of design in 1984 and has worked in both New Zealand and Australia. He currently works for clients across the globe, in America, Australia, Ireland and the UK. His clients include Coca Cola, Heinle Publishing, Hinkler Publishing, Lion Nathan and many other high profile brand names. Gerad lives with his wife Anne and children Madeline, Charlotte, and Max in Greytown New Zealand. Conceptual illustrations in oil and acrylic for newspapers, magazines, advertising, annual reports and corporate uses. Realistic illustrator and comic artist speciallizing in SciFi, fantasy, and pinup art. Trade association representing graphic designers and illustrators. A semi-annual illustration conference that focuses on issues, marketing and events in the illustration community. Meets in June 2001 in Santa Fe. A great place to meet illustrators. This active club includes members from Maryland, Virginia and Washington D.C.. Extensive site includes portfolio pages of members and information on upcoming events and shows. The official web site of the National Cartoonists Society. View the portfolios of any of the best Australian illustrators in the world. Nationally prominent illustrator portfolios representing a variety of media for publishing, design, advertising, editorial, packaging and web applications. The Science Picture Company specializes in creating stunning science & medical art, illustrations and animations. Children's illustrators and writers. Bulletin, awards and grants, events. The OTHER kind of visual communication. I have over 10 years experience with a Bachelor's of Fine Art from the Ringling School of Art and Design. My portfolio includes graphic design and illustrations for a variety of projects. Need a cartoon, illustration or logo for your website or publication? Top cartoonists Bill and Bob Thomas will slap a custom Thomastoon on everything from clipart to coffeemugs. Fast and affordable. Vibrant, conceptual paintings done in watercolor and oil. The on-line portfolio of award winning artist and illustrator, Bill Thomson, featuring children, wildlife, sports, and a variety of diverse subject matter. My art has always been about communicating. I just don't make much verbal sense so I draw, and how I feel comes out in my work. It's all commercially driven these days but my client base has developed around my passion and the path my life has taken. The fact that I live in a remote location in the Sierra Nevada Mountains has not hindered my progress as an illustrator even though I paint all my illustrations digitally. I spend a lot of time with kids, both my own and coaching others in sports, and my work definitely reflects that ever-growing relationship. I'm still a kid at heart and I want people to see what I've done so I find myself yelling "Hey, look at me!!" as I run around in circles waving my hands and laughing. Playful digital illustration specializing in children, young adults ("tweens" as they say) and on up. Cartoons and illustrations for editorial, advertising and digital use. John W. Tomac is a Brooklyn, N.Y.-based illustrator. His work has been recognized by Communication Arts. Visit johnwtomac.com to see more of his work. I love making pictures. For me it is the best job in the world. I have over 12 years of experience since graduating with an MA from Central Saint Martins College of Art and Design London in 2002. My work has been featured in numerous publications including D&AD, Eye Magazine and numerous times in the prestigious Images Annual – The Best of British Illustration. I frequently exhibit my work – with my latest exhibition being “Images 36 – The Best of British Illustration” at the Bankside Gallery, London in Summer 2011. Children's book and editorial illustrator. Thoughtful, stylized photo-collage illustration with strong graphic appeal and a powerful visual impact. Editorial and business, line drawing, black and white, mixed media, photo illustration, photo collage, photoshop. Socially conscientious, colourful and warm illustration for advertising, design, corporate, editorial and publishing. Commercially viable artwork designed with a graphic finesse. Partial client list includes Ireland and Associates, Registered Nurse Journal, American Baby Magazine, Joseph's Coiffures, Nuvo magazine, Benefit's Canada Magazine and The National Law Journal. Jing Jing works with a variety of clients such as The San Francisco Chronicle, McDonald's and Crayola. Her work has been featured in the Fresh section of Communication Arts. Her images are an eclectic mix of textures and hand drawn art work. Final files are all digital. Call Schumann & Co. to find out more: 1.800. 710. 1969 or call direct, 808.325.1445. Freelance illustration and design studio. Specialties include: caricature, advertising, editorial, book, institutional, web. Conceptual, poetic images that digitally layer painting, photography and assemblage for advertising, publishing, corporate, and editorial communications. Neil Wallace AKA 'Bezalel-Ink'. I have recently renewed my pen and ink work as I enjoy this the most. All are my own original artworks drawn, in most cases, from my own photographs. I welcome all questions. Medical illustration and communications for the pharmaceutical, medical-legal and healthcare industries. Samples of the Canadian artist's watercolour paintings and book illustrations.